-Works (For a While) -Dries quickly -No smell -Cheap with coupon -No purging for me. -Spot treatment for back acne. -Causes some irritation. (i.e. Itching, Redness, Sun sensitivity, Extreme dryness) -Sadly my skin got used to it. -If you forget to use it once, you break out. -Can bleach towels if you don't was it off your fingers completely. -Does nothing for the scars acne can leave behind. I was put on Epiduo in November 2011. It is now July 2012. 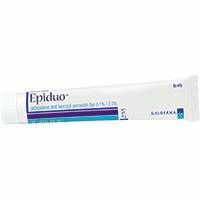 Epiduo worked wonders for me and I thought I found the cure. It cleared my face up about 95% in about a month. Sadly, in June 2012, for some reason I broke out terribly (Worse than my face was before Epiduo) and it stayed until now. I also had EXTREME dryness, like if I got out of the shower or a pool, it was time to bring out the moisturizer. It also made my face extremely sensitive to the sun, and my face wont get an even tan. I have to use a ton of moisturizer, even with my oily skin. I went back to my Derm. Two days ago and he put me on Tazorac and Aczone. This is my last option because I am now on some list for Accutane.